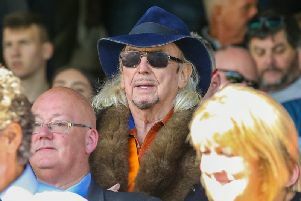 A legal bid to have a court receiver appointed to force controversial Blackpool FC owner Owen Oyston to pay the £25 million he still owes Valeri Belokon began at London’s High Court today. One of the country’s top judges is being asked to pave the way for a Court Receiver to discharge the assets of Oyston, plus those of Blackpool Football Club (Properties) Ltd, formerly Segesta Ltd, which owns Blackpool FC, the stadium, the training ground and the Travelodge hotel. Mr Oyston, who owns 24 properties, including his 20-acre home Quernmore Hall in Lancaster, and has shares in six companies, is opposing the application. Among his shareholding are 1,604,694 shares in Blackpool FC (Properties) Ltd; 3,500,002 shares in Oyston Estates Ltd; and 500 shares in Closelink Ltd.
Closelink owns Whyndkye Farm land, the site of a proposed 1,400 home garden village in Marton. Valeri Belokon’s lawyers are asking Mr Justice Marcus Smith for a receiver to be appointed by the court in an attempt to bring to an end the long-running saga, in which Mr Belokon is trying to recoup the £25 million he has been owed by Owen Oyston since November 2017. At the start of the hearing, Barry Isaac QC, for Mr Belokon said shares in NatFarm Ltd, which owns Claughton Hall and Mr Oyston's 50 per cent share of the Kempinksi Apartment in Spain would be excluded. Mr Oyston, 84, and his wife Vicki are divorcing and she lives in Claughton Hall. High on the agenda for the judge was what would the implications be for Blackpool Football Club if he imposed a receivership. Mr Isaac had said that selling the shares in the club would be complicated but there was a market for the club itself. There had been a number of interested parties - listed from "A to Y", he said. He continued: "Clearly there's a potential market which could be tapped." The suggested court appointed receivers were named. They are Paul Cooper and David Reuben. The court was told that they both had football related experience. Mr Cooper had worked on administrations for Portsmouth and Coventry City FCs, and Mr Reubens on Barnet's, Crystal Palace's and Millwall's. He said their fee would not go above £1.25 million, five per cent of the judgement debt. Asked by the judge if plans were already being worked on regarding Blackpool FC, Mr Isaac said "a lot of work" had already been done. He told the judge: "The plan at this stage is to replace the board as far as the club is concerned, to replace it with suitable individuals, and it is anticipated they would include on the board representatives of the Supporters' Trust, with the intention of continuing to run the football club and the business." Mr Isaac also indicated that Belokon would be willing to provide "a security or possibly even funding" to keep the club going so the club could be sold for its maximum value as it was a valuable asset. The issue of the club running the risk of a 12-point deduction by the EFL was also debated between barristers and judge. The judge read a letter from the EFL's governance and legal director. It referred to how any deduction was discretionary; that in exercising that discretion the EFL board would consider whether the receivership was material to the club's ability to fulfil its obligations; it would look at whether the club had access to sufficient funding to fulfil its remaining fixtures etc; would look at what the receivers proposed to do; and it would provide an opportunity for submissions to be made about whether or not to exercise its discretionary power before it made any decision.